President Trump promised us he would “drain the swamp” and hire “only the best” – his words. 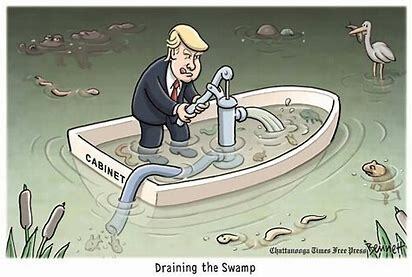 What does “Drain the Swamp” mean to you? Does it mean to eliminate expertise as a requirement for high office? Does it mean that little value is placed on experience? What does “only the best” mean? That the only qualification for high office is to agree with the president? Does it mean being a TV personality? Does it mean hiring staff with accusations of wife beating who can’t pass security clearances? The president seems to favor hiring billionaires, accused criminals, lobbyists, family members, TV personalities, or previous staff who worked for him at his company. His criteria seems to be loyalty to him; not necessarily loyalty to the country or to its citizens. What would compel someone who has never tried a case in court to think he is qualified to be a judge? And what would the president be thinking to nominate such a person? Is this the best we can do? We pay the salary, travel expenses, and all security costs for cabinet members and White House staff, but do they care about us? Do they care about our country? I know we can do better – a lot better and I look forward to November. We will vote for candidates who care about expertise, competence, experience, honesty, frugality, compassion and getting the job done for All Americans!